Bobi Wine addressing the media shortly after his release at Kiira Division Police. Courtesy Photo. 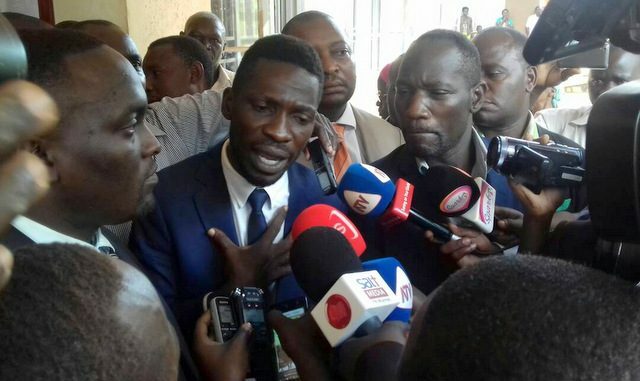 Kyagulanyi Robert Sentamu popularly known as Bobi Wine, one of the candidates in the Kyadondo East parliamentary race has been arrested. 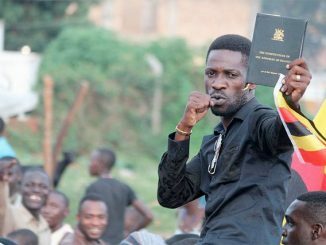 Bobi Wine was arrested for holding a campaign rally in a place where he was not supposed to be, according to police officers at the scene. 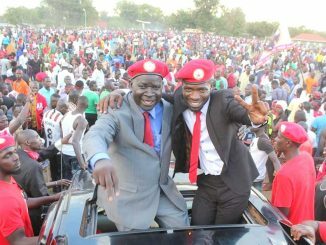 According to an earlier post by Bobi Wine on social media, he was due to address his last campaign rally at Kasangati Saza Grounds at 12 noon. However, police says Kyagulanyi’s known rally was supposed to be in Katadde and not Saza grounds. Information reaching is that he is now detained at Kiira Division Police headquarters in Kiira municipality. His arrest has sparked off a scuffle between police and hundreds of his supporters at Kasangati trading centre. Our reporters at the scene say that the rowdy supporters have blocked roads around Kasangati with logs, benches and stones in protest of Kyagulanyi’s arrest. Others descended on the police post hurling stones at the police officers at the scene. There is heavy deployment in the area. President Yoweri Museveni, the NRM party leader is expected in the area to campaign for the NRM flag bearer Sitenda Sebalu, while Dr Kizza Besigye will be campaigning for FDCs Apollo Kantinti as the end their campaign trail today. Voting is scheduled for Thursday June 29.